Over a month away from home; traveling from Mn -> SC ->FL->SC->GA->FL->GA->SC->GA->MS. The stress of training is high. The pressure to perform well is real. Meshing with new teammates is tricky. Bank account is empty. Working on the go is scattered. Race season diet (lack of real meals) is a big adjustment. Loved ones are missed. The urge to wear non spandex is real. Hot showers are a treasured commodity. You get the idea. This life isn't glamorous. This is a life I choose. My life is full of good problems. These are problems I suffer through to achieve what I want, to reach my goals, to be happy. This mentality was crucial this weekend at the first real race of 2018; ToSH (Tour of the Southern Highlands). The race is a stage race, consisting of a nighttime 55min criterium race, 1.2 mile merx time trial, 20 mile circuit race, and 75 mile road race. If that seems like an odd combination of events, it is. Never have I participated in a race that include a crazy short TT along with a very long (for womens cycling) road race. As you can imagine, I was quite excited for the road race, but I would have to suffer (and suffer I did) through the other 3 events to get to my final prize. The crit was strange to say the least. 7pm start made for a very dark, barely lit course. While the .8 mile course was fun, it was mentally trying due to the extreme darkness, potholed roads, and excessive barriers making the roads seem very narrow. To add to the strangeness, we had a pretty small field size, 20 P1/2 women, with likely equal amount of spectators lining the sidelines, and were made to do a 'parade' lap; a neutral lap to show off before coming to the line again before the official race start. After starting in the back, I made my way to the front leading the race efforts for several laps. Somewhere around halfway there was a wreck taking out most of the field. Luckily I was in front and safe to ride on. Two laps later, they allowed the crashed out women to rejoin the race, bringing the field back together. Typically, crit races have intense paces and heart rates to match, but this one was different due to the nature of the course. Everyone was a bit timid. On the last lap I lost my place up front and was boxed out of a corner leading to the finish. Ugh. My fault. I should have been more aggressive at that point. I crossed the line in 13th. Not really the best start to a stage race and very disappointing after putting in a large amount of work at the front. A real reminder that I need to race smarter and not just make random efforts. The TT. 1.2 miles is pretty unheard of in time trail races... at least as far as I know of. I mean, how do you judge a 3 minute effort?! A ramp start into a right turn with .6 miles slightly downhill with a tight U-turn and .6 miles back slightly uphill to the finish. I was baffled and completely unsure of how to gauge this. Well I totally messed it up by taking the down hill portion too easy and being overly cautious with the tight turn around. Boo me. I finished near the back of the results. Luckily it only cost me a few seconds, but still.. I was feeling down. The TT was at 10am and the circuit race at 4pm. After cool down, packing, driving... this left us a total of 3 hours at the host house. Basically enough time to eat, prep food for the evening and stretch before heading back to the race. As we returned to the start area, we realized that the course went through a very high traffic road and it seemed like it was open to cars. We watched as cyclists from other race categories weaved between vehicles on the downhill stretch. Ummm... eek? Once kitted and ready to race it was clear that we would not be racing anytime soon; the event was running nearly an hour behind. When we finally got to the start, our race (yes, and the men's P1) had been shortened by 1 lap; making a 20 mile race a 16 mile race. Due to half the 4 mile course being a straight shot downhill, there would be no breakaway, no ability to shed anyone. This knowledge made for a rather slow race with everyone doing little work for 4 laps. My team organized at the front with 2 miles to go and lead the race into the last turn and final stretch with myself and Jennah at the front. As we pulled away, the others would hopefully be in position to sprint, and they were! Except the sprint got sketchy and someone's rear derailer went into Amelia's front wheel, took out 3 spokes, flipped her over her handlebars and onto the pavement with the bike landing on top of her. I quickly jerked right into the curb, having to unclip to avoid riding over my teammate. I rolled to the finish nearly last. 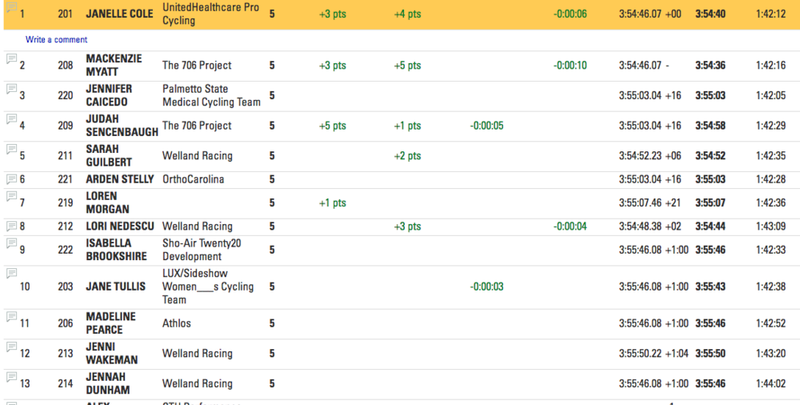 Luckily Amelia was just banged up and missing some skin and a front wheel and was able to hobble across the line for an official finish and avoid a hospital visit. While I was happy Amelia was alright, I was in a pretty low mood that I was really finishing poorly at this stage race. My mental state was wearing thin. These races weren't even high speed or high power... data showed the numbers were far below what I'm capable of so what was going wrong.... Should I be out here racing? Is it time to quit? I thought I has in good shape but.... I was thinking of everything I'd gone through to be here, all the sacrifices to race another season and for what? To be last and upset and stressed out and depressed? Sigh. That night we had a team dinner with the entire Welland Family (juniors/ supporters/ staff) and it helped to remind me that I was part of something bigger now. I was on a solid team this year and that counted for something. These people believed in me, I needed to believe in myself. I tried to remind myself that Sunday was a new day, the day I was looking forward. When I opened my eyes Sunday morning, I felt fresh and peppy. Yay! Road race day! This was it, this was my shot. 75 mile race. 5 laps of 15 miles with 2 climbs per lap along with 2 sprint points and 2 QOM points. This should be fine. This should be fun. And fun it was! We started at 37 degrees. Brr. Embro'd legs, thick arm warmers and long gloves were chosen. I wore a jacket to the start line, so thankful to have team support to grab the jacket from me at the last possible second. Another wonderful resource my team support provided was a course key taped to my top tube. I won't bore you with the minute by minute action of all 75 miles, so here are the juicy bits. Things started neutral for 2 miles to give riders a preview of a 'sketchy' bridge area. I found this to be one of the least sketchy bits on the weekends racing and if I find something un-sketch, its probably pretty damn mild. The first climb was at mile three (& again at miles 18,33,48,63). I knew this from pre-riding the course Friday morning. On that pre-ride I got the QOM for this climb and found it quite easy to conquer and made my confidence very high going into it during the race. Just as I thought, I easily attacked the group on mile 18 and stayed away for a solo break for a couple miles until sitting up to rejoin the pack and rest until the second QOM climb. Climb two, the QOM climb, was a .8 mile stretch with 3 'steps'. It was a toughie and QOM points would come at laps 2 & 4. On lap 2, I took off and lead the climb until two others came around me on the last pitch. I couldn't match them and took third at the top. We sat up, spun and let the group reform. Mile 28 of a 75 mile race was too early for serious efforts. Jennah was quick to keep me in check. Telling me to save it, to stay in the small ring and not get antsy. I appreciated her wisdom and knowing I had a team to work with/for kept me smart and secure in my plan. Lap 3 was a sprint lap, and also the first feed lap. The feed was located just before the finish, meaning riders had to choose between getting bottles or winning sprint points. It was a ridiculously chaotic feed zone but the group stayed pretty much all together heading into lap 4. Having a team of 4 in this race (we lost one due to the crash in the previous day's circuit race) meant we were forced to do some work. We stayed near the front and took our pulls to keep the pace going strong. Like any race rotating paceline situation, half the group was working and half were sitting in at the back. Knowing I wanted to give the second QOM a solid attempt, I got myself to the back for 3 miles of rest while Jenni and Jennah worked to attack each other at the front, keeping the pace going and hoping to wear some others out before the climb. Roughly a quarter mile before the climb started, I moved towards the front so as not to get held back or trapped. I was able to get onto Jennah's wheel just as the climb started and told her 'TAKE ME'. Yes I could have used nicer words, but I was in race brain fog and thats all I managed to say. Luckily she got my drift and took off, attacking the climb hard with me on her wheel. As soon as I felt her pace backing off, I went hard around her to continue to the top. I heard her yell 'GO LORI GOOOOO' and I went. There was a big gap and I took the climb points by a long shot. What an amazing team effort! That was probably the coolest moment of the race. I put my head down and gave it all I had to keep the pace hard post climb. I wanted things to shatter. 3 others joined me (one of them teammate Sarah) as we hit the fast decent and rotated to keep the break going. The four of us started lap 5 with a solid lead but were caught by one and then another and then the whole group (minus some that totally popped off) before the first climb of the last lap. I gathered my teammates and was very clear; we are repeating that this lap. We had 2 out of 4 in front to cross the finish before a bunch sprint. That was best case and we could make it happen again on this final lap. I had the legs. I was happy and smiling and there was no question in my mind, we were doing that again. Jennah and Jenni agreed and said they might not have the legs to repeat that at 100%, they would do everything they could to replicate the situation. They did not disappoint whatsoever. This time I was very smart. I hid for most of the lap between mile 64&70, popping out occasionally to pull through or communicate with my team. I drank. I ate (taking in roughly 1000 calories throughout the race). I smiled at how great my legs felt. I was ready. Jennah and Jenni again were on it at the front. Making sure things to keep any potential attacks in check and the pace moving. It was clear the pack wanted to take it easier before the final climb, but we wanted the opposite. Same thing, just before that final climb I got myself to the front. No one thought things would be easy this time. Everyone scrambled to begin climbing and I fought hard to keep the pace as high as I could as the climb pitched up. Things were strung out but not shattered as I peaked behind me. I pushed as hard as I could, not letting off for a second as we went up the second step. Here things started to break apart. Mackenzie Myatt & Janelle Cole were right on my wheel and even came around to match my effort. Sarah was just off there pace in 4th. We fought hard to get as much of a gap as possible up that final leg burning pitch to crest the climb and head to the finish. The four of us rotated hard, Janelle's downhill pull was almost too much for me to match. I gave it another pull, determined not to let up and get caught before the finish. The final quarter mile was a struggle to stay on the wheel of Janelle & Mackenzie as they pushed hard. Sarah fell off pace. I gave it my all to stay on as the other two definitely had more energy for a hard final sprint to the line. They got 2 seconds on me, leaving me to take the third spot. I was almost in tears of joy. We had just earned Welland a podium at the year's first stage race. Everything went as well as I think it could have (well I could have got first or second, but besides that...). We talked, worked together, executed, and played it smart as a team. I ate, drank, hid, read the race, and communicated well. I felt redemption on why I was out here racing. Yes, I could do this. I did do it. FREAKEN PODIUM. My body is ready for the season. As I write this, I'm still smiling and cannot wait for more. To top off my podium (which was made possible by teamwork!) the rest of the squad held it together enough to win the team award!! Sarah took a strong 5th place in the GC and me in 8th. The Welland Racing Domestic Elite Squad is going to make a solid mark on the racing scene this year!!!! I'll head back to Minnesota for a few weeks. Train hard. Eat well. Enjoy being home. Then I'll be off for another large block of traveling and racing starting with Alabama Cycling Classic.